Any good coming-of-age tale is bound to be evaluated by two questions: What happens to our young lead character in the end, besides looking older on the surface? What happens to us as observing that inevitable process of maturation? 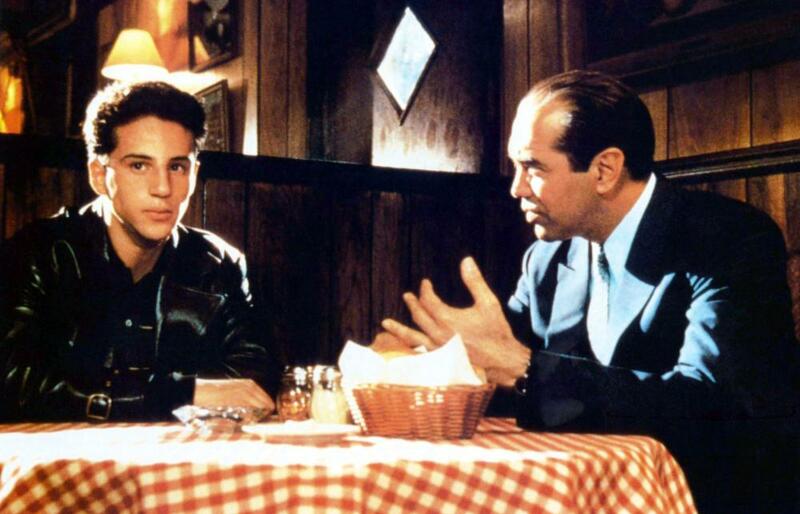 While the hero of “A Bronx Tale” recounts nostalgic memories of his early years, the movie takes us into his small world via intimate drama and strong characters, and we see how much he was influenced by two different father figures. As we become involved in their story, the relationships among these three main characters turn out to be more complex and poignant than we thought, and we are deeply moved when our young hero comes to learn some important lessons he will keep for the rest of his life. It is 1960, and Calogero Anello (Francis Capra) is a nine-year-old boy living in the Italian neighborhood of the Bronx. Although his parents Lorenzo (Robert De Niro) and Rosina (Kathrine Narducci) keep telling him that he should stay away from a bar right next to their modest apartment building, Calogero cannot help but be attracted to that place because most of its patrons are local mafia members led by Sonny LoSpecchino (Chazz Palminteri), an assured, charismatic boss and de facto owner of the bar. The way these colorful figures are introduced to us one by one through Calogero’s viewpoint is reminiscent of a similar scene in Martin Scorsese’s “Goodfellas” (1990); like young Henry Hill in that scene, Calogero watches neighborhood gangsters from the distance with innocent awe and fascination, even though he knows that they are not good people. Not long after that incident, Sonny lets Calogero into his world to show his appreciation, and Calogero is excited by this opportunity. While frequenting the bar more than before, he becomes another usual figure in the place, and he also enjoys his changed status in the neighborhood. At one point, he is allowed to participate in craps under Sonny's guidance, and he has a really fun time along with Sonny and others, getting more money than he ever imagined. Of course, Calogero’s parents are not so pleased to see their son getting involved with Sonny. Lorenzo eventually confronts Sonny, but their conflict, which is put into a sort of cessation after that confrontation, does not turn out to be as simple as we thought. Although they are opposed to each other due to their different values, both of them care about Calogero, and are sincere when they respectively impart to Calogero their life lessons to guide and help him. While exemplifying working-class virtues through his diligent work, Lorenzo constantly reminds Calegro of what his son can do for a better life out there (“Nothing is more tragic than a wasted talent”). Although he has many vices as a dangerous criminal, Sonny has his own streetwise wisdom, which can be distilled into a seemingly cynical but undoubtedly incisive motto often uttered by himself (“Nobody cares”). 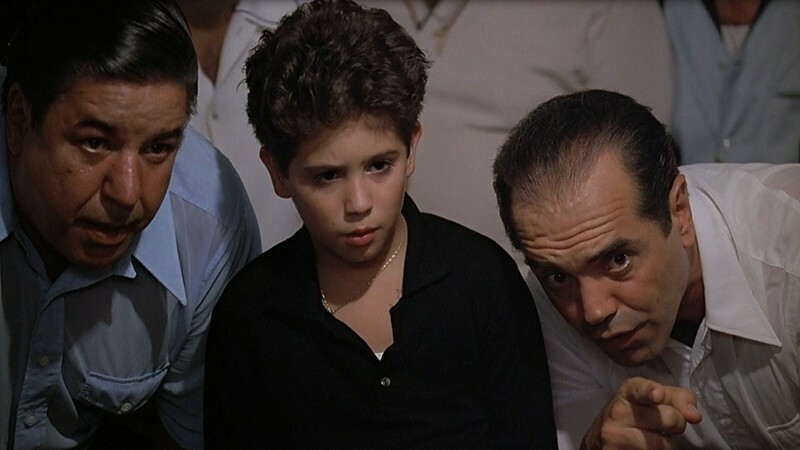 We identify more with their fatherly concerns as Calogero is shown eight years, now played by Lillo Brancato Jr. and usually called “C." He still hangs around his childhood friends, and we see potential for trouble especially when they casually express racism toward African American people living near their neighborhood. Being more sensible than his pals, Calogero does not like this at all, but he cannot just walk away from them because, like many kids around his age, he is not so willing to think and act independently. But then there comes a point where he has to make up his mind for himself. During his usual bus ride with his father, Calogero happens to notice a pretty African American girl in the bus, and then he sees her again at his school. After he spends a little private time with Jane (Taral Hicks), his heart flutters more than before, though he's troubled by how his first love may be regarded by others. Naturally, he seeks advice from both Lorenzo and Sonny, and how he gets their respective advice is one of the most humorous moments in the film. When Calogero asks a rather indirect question to Lorenzo, the father is not easily fooled by that, and he gives an equally indirect but wise piece of advice to his son. In the case of Sonny, Calogero tells him more openly about his interracial romance, and Sonny offers straightforward counsel along with a dating tip which, in my humble opinion, is far better than something from those throwaway self-help books about relationships. Their advice may sound different on the surface, but they both point out the same thing to Calogero, who soon comes to see that they are right. The movie is based on the one-man show of the same name written by Chazz Palminteri, who also adapted it for the film. After getting fired from a club bouncer job due to his small mistake involved with famous agent Swifty Lazar, Palminteri, who was having a hard time as a struggling New York actor during that period, decided to write a story inspired by his early life in Bronx. The eventual outcome led to the first major success in his career, which was then followed by a number of enjoyable movie performances including his wry Oscar-nominated supporting turn in “Bullets Over Broadway” (1994). As reflected by Palminteri’s real name, Calogero Lorenzo Palminteri, Calogero in the movie is the fictional counterpart of his younger self. Palminteri’s father Lorenzo was really a bus driver. Sonny is based on a local mafia boss who was close to young Palminteri. Some other characters in his story are also based on local figures he knew during his early years. Palminteri’s nuanced performance in the film presents Sonny as a compelling human character to watch. Like his real-life counterpart, he is an intelligent man who could be a more productive member of society if he had grown up in a better environment. While he can open his heart a little to the boy he probably loves more than he admits, Sonny is still a creature of crime who chose a tough, lonely life on his mean streets, and, as he flatly admits later in the story, has accepted and lived with the price for that in the name of survival. In addition to giving a performance as warm and thoughtful as his recent appearance in “The Intern” (2015), Robert De Niro also directed and co-produced "A Bronx Tale," which was dedicated to his father who passed away not long before it was released. This was his first attempt at directing, and, considering what he accomplished here, it is a shame that he has made only one feature film since then. De Niro also makes a good use of various popular songs from the 1950-60s. I enjoyed a couple of nice doo-wop scenes which reminded me of what I saw from Clint Eastwood’s passable musical film “Jersey Boys” (2014). I also liked how the Beatles' "Come Together" was used as the prelude for a violent payoff during a sequence involving a bunch of biker gangs who unwisely mess with Sonny. As a matter of fact, De Niro and Palminteri recently worked together with composer Alan Menken for the stage musical version, which had its premiere in New Jersey early in this year. Between De Niro and Palminteri, Francis Capra and Lillo Brancato Jr. function as the heart of the film. Their performances are seamlessly connected, and what happened to each of them during subsequent years ironically mirrors its story. In contrast to Capra, who has been steady with his acting career while looking a lot different now (he played that biker character in TV series “Veronica Mars," by the way), Brancato tumbled down into serious troubles including addiction and murder, and was on parole in 2014. While tense and gritty at times, “A Bronx Tale” is a sweet, funny, and touching coming-of-age story thanks to its vibrant mix of humor and drama. Its last act feels a bit hurried as it goes through a series of intense moments during a relatively short span of time, but that works mainly because it is still driven by characters and human relationships instead of plot contrivance. Although there is an expected "fallen idol" moment around the climax, it comes with real emotional impact because of what has been established and built up to that point. We then get another powerful moment as the story makes a full, satisfying narrative circle, as coupled with karmic poetic justice and a good cameo appearance by a certain recognizable actor. Sonny may not care, but Calogero and a few others care anyway—and so do we.